We specialize in small quantities as low as 1 item. We take your picture(s), graphics, company logo, writing, etc. and put them on the items listed below. 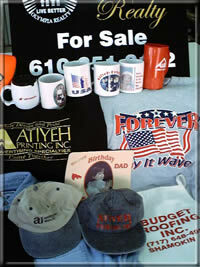 Use these for gifts, keepsakes, advertising giveaways and more. Give them to family, friends, business associates and/or employees. Call us for pricing. Cost depends on the complexity of the design, quality of the item you are imprinting and the number ordered.